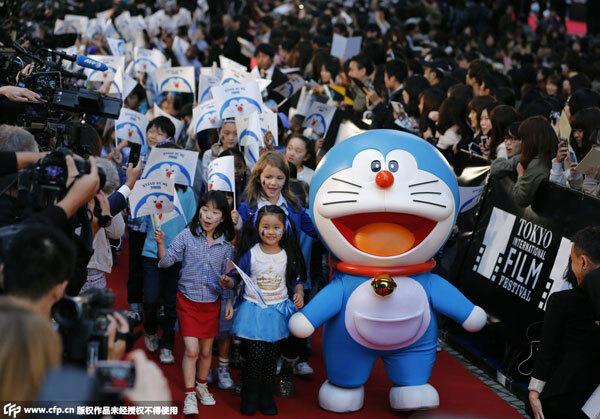 Manga character Doraemon walks on the red carpet with children from around the world during the opening event of Tokyo International Film Festival to promote the movie "STAND BY ME Doraemon" in Tokyo October 23, 2014. Japanese 3D animation film "Stand by me Doraemon" is set to hit Chinese cinema. The film has been a huge box office hit in Japan earning more than 70 million US dollars since its release in August. Directed by Takashi Yamazaki and Ryūichi Yagi, the movie is based on the Japanese manga series. "Stand by me Doraemon" centers on the friendship between two best friends Doraemon and Nobita, from the time they first meet to their final departure from each other. The film has already been playing in 57 countries and regions around the world and China will soon be added to the list, as it is set to debut in Chinese cinema early 2015.